Journalists Hamza Tav and Abdullah Ozkul of Anadolu Agency released an article a few days ago about the new finds at the site of Niğde Kınık Höyük that I direct. The excavation project is a joint research project of the Dept. of Humanities, the University of Pavia, and the Institute for the Study of the Ancient World at New York University. Besides funds provided by the two institutions, the project is supported by a grant from the Italian Ministry of Foreign Affairs and the fund for excavation projects at The Metropolitan Museum of New York. The articles published by the journalists are correct, but they mainly report on the discoveries of the campaign 2014-2016. In those years excavations in Operation A, sector A1, led by ISAW PhD candidate Andrea Trameri, uncovered and investigated four rooms of a sanctuary with two main levels of occupation: one Late Hellenistic and one Late Achaemenid to Mid-Hellenistic. Characteristic finds of the earlier levels were zoomorphic vessels mainly representing birds, often birds of prey. In the Late Hellenistic period, besides a number of coins hoards and other precious metal objects, fragments of three female figurines were found: two of them were recognized as a Kybele and an Aphrodite (the latter an import from Tarsus), the third is too fragmentary to suggest an identification. Excavations continued in this sanctuary also this year and are still ongoing while I am writing. The great news of the year, however, is the discovery of new monumental public architecture and finds east of the sanctuary. 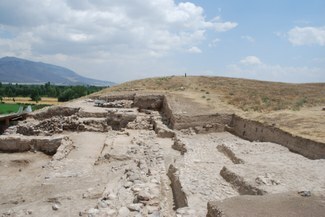 Excavations in this new trench (Operation E), directed by Dr. R. Casagrande Kim uncovered the citadel walls of the Hellenistic and Achaemenid period, and likely the northern gate of the acropolis of the temple-city, leading into its monumental public space. Over the building materials, we found hundreds of ceramic fragments that we now understand to have originally belonged to at least ten statues of bulls. Reconstruction of the statues is ongoing, but from the dimension of the bull-heads, there were two main sizes: statues of ca. 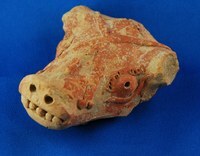 50 cm length (head ~15cm), and statues of more than 1m (head ~35cm). Some more fragments of these ceramic statues had figurative appliques of Greek gods Athena and Dionysus, and a molded panel of Silenus on a donkey in a frame of grapes. 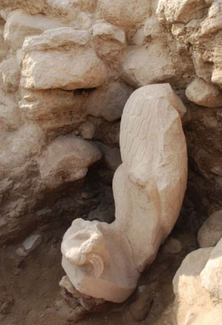 Votive inscriptions and marble architectural decoration complete the set of finds. We interpret this context as deriving from a second sanctuary located to the east of the piazza, possibly dedicated to Dionysus. The presence of an Hellenistic cult of Dionysus in the region is particularly plausible because it could be considered to be a Greek interpretation of the Neo-Hittite local cult of Tarhunzas of the vineyard, well-known thanks to its representation on the IVRIZ relief. To confirm this hypothesis, excavations will resume in 2019 on the eastern side of the piazza. 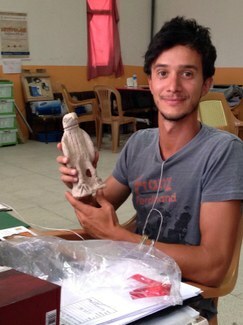 The most impressive find of the whole excavations occurred in the last week of the campaign. Buried against the citadel wall in a pit, we found a marble statue of an eagle grasping the head of a wild-goat against the ground with its left talon. The statue is more than life-size, measuring ca. 1.5m in height. Its head was found in the previous campaign in the same spot at a higher elevation. The eagle statue, which represents a widespread symbol of power in Hellenistic and early Roman Anatolia, underwent restoration at the archaeological Museum of Niğde. 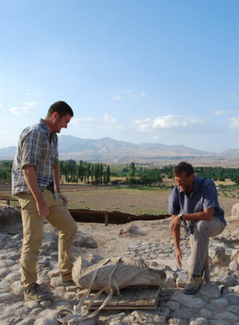 Follow the link to see an on-site interview with Professor Lorenzo d'Alfonso at the Hellenistic-era temple conducted by the Turkish press.